Rita Wilson and Tom Hanks host The Shakespeare Center of Los Angeles (SCLA) 27th Annual Simply Shakespeare benefit Monday, September 18, 2017 at 8:00pm at the Freud Playhouse, on the UCLA Campus. 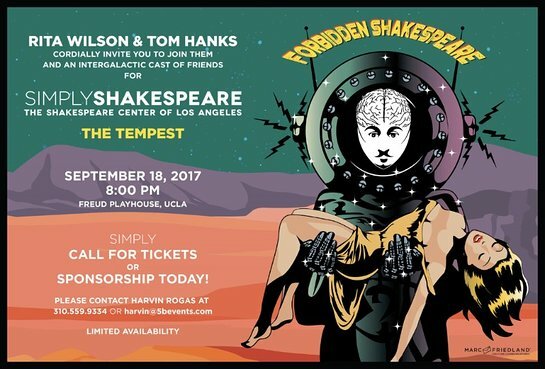 The hilarious Forbidden Shakespeare – The Tempest offers an evening of improvised Shakespeare and song featuring Charles Lester playing a theremin and an intergalactic star-studded cast including Rita Wilson, Tom Hanks, William Shatner, Kyle Maclachlan, Michael Chiklis, David Cross improvising their way through a condensed version of The Tempest. Additional participants will be announced shortly. The evening is sponsored by the Entertainment Industry Foundation and includes a pre-show wine reception kindly provided by the Gallo Family of Wines, followed by a post performance reception with the cast. All proceeds from the event support the SCLA and its arts-based employment programs for chronically unemployed veterans and urban youth, that blend White House award-winning immersive arts engagement for youth living at the poverty threshold, chronically unemployed vets and award-winning professional productions supported by a veteran workforce. One lucky bidder will have an opportunity to join the evening’s cast as part of an eBay auction lot which includes a brief speaking part in The Tempest production, a guest ticket, admittance to the exclusive after party, copy of a script signed by all performers and photo with the entire cast. Click here for more information and to place your bid. Simply Shakespeare previous all-star casts have included Sir Paul McCartney, Paul Simon, Bette Midler, Smokey Robinson, Jackson Browne, Natalie Cole, Lyle Lovett, Reba McEntire, Tim McGraw, Faith Hill, Sir Anthony Hopkins, Sir Kenneth Branagh, Billy Crystal, Jason Alexander, Kate Hudson, Tim Allen, Christina Applegate, Annette Bening, Sally Field, Kelsey Grammer, Neil Patrick Harris, Helen Hunt, Eric Idle, Val Kilmer, Lisa Kudrow, Steve Martin, Matthew Perry, David Hyde Pierce, Jada Pinkett Smith, Keanu Reeves, Julia Roberts, Ray Romano, William Shatner, Martin Sheen, Martin Short, Will Smith, Sam Waterston, Robin Williams, Anthony Mackie, Patrick Warburton, and Renee Zellweger. Since 1985, The Shakespeare Center of Los Angeles has been a vibrant hub of unique programs, performances and events designed to make Shakespeare accessible and engaging to all. SCLA enrolled 23 chronically unemployed veterans in technical theater training course at Santa Monica College while hiring those veterans and providing them on-the-job training backstage. Veterans In Art, SCLA’s successful transitional veterans employment initiative, provides for unemployed veterans and vets enrolled at SMC transitional summer employment in tandem with college accredited technical theater training. Will Power to Youth a White House awarded youth employment and academic enrichment program that immerses urban Los Angeles youth living at the poverty threshold in hands-on artistic experience with paid summer jobs, and training in the rigors of theater art making. The program has been nationally recognized for its effectiveness in reducing high school dropout rates and instilling a lifelong appreciation for Shakespeare and live theater. For more information on the Simply Shakespeare benefit performance or SCLA, please visit www.ShakespeareCenter.org.